The Month of Khojaly declared in Ukraine with the joint organizational support of the Union of Azerbaijani Youth of Ukraine, Youth Forum of the Organization of Islamic Cooperation and Kharkov organization of the Congress of Ukrainian Azerbaijanis has started in the city of Kharkov. The event involved representatives of the Kharkov oblast administration, activists of the Azerbaijani Diaspora, as well as representatives of local mass media. The event participants first joined the ceremony in memory of the victims of Khojaly tragedy, laying flowers to the memorial board on the house, where the national hero of Azerbaijan Viktor Seregin lived in Kharkov. 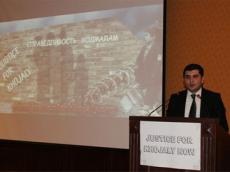 Head of the Kharkov organization of the Congress of Azerbaijanis of Ukraine Gurban Abbasov informed about the massacre in Khojaly, as well as the occupational policy of Armenia against Azerbaijan. Then, the event participants watched the film about the Khojaly events, narrating about the atrocities committed by the Armenians against peaceful people. The film was prepared by the Heydar Aliyev Foundation.